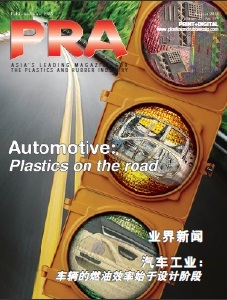 The recently concluded K2016 show, undoubtedly one of the largest plastics shows in the world, is a place where companies introduce their best innovative technology. One such company was German injection moulding machine maker Arburg that launched its largest machine in its stable, the Allrounder 1120 H with a clamping force of 650 tonnes, with the new Gestica control system. According to Heinz Gaub, Managing Director Technology & Engineering at Arburg, the hybrid Allrounder 1120H extends the top end of the company's products, combining electric speed with hydraulic power. The dry cycle time is 2.4 seconds and the maximum opening stroke is 1,050 mm. The machine was shown moulding a 1,092 g folding step stool designed by the Design Tech design studio, which was also involved in the development of the new Allrounder. 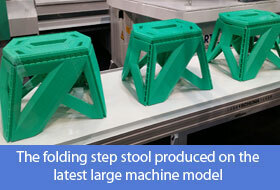 The step stool was moulded in a turnkey system producing eight individual parts in one process that were removed by a Multilift V robot, with a 40 kg load-bearing capacity. The newly launched robotic system transferred the parts to an assembly cell with six-axis robots, where the stool was finished and assembled within the moulding cycle. 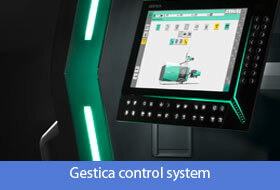 Meanwhile, the new Gestica control system, which is based on Arburg’s earlier Selogica control system, is updated with a modern glass front and industry-compatible multi-touch technology. With the new "Easyslider" operating element, movements can be simply and precisely controlled and displayed via colour-variable LED technology during set-up, says Arburg. Acceleration and deceleration can be controlled "with a swipe of the finger" along a bar at the edge of the screen. The data records of the new Gestica and Selogica control systems are compatible and the hierarchical structure and graphical programming system are identical. 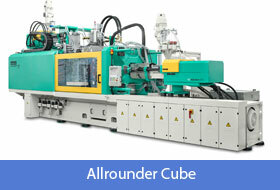 Other machines that were debuted are the new Allrounder Cube series and the new Allrounder 2000 T rotary table machine. The Cube is designed for high-speed cube-mould applications and has the possibility of mounting moulds of up to 16 tonnes. The machine boasts 10% more output with 25% lower energy, said Arburg. 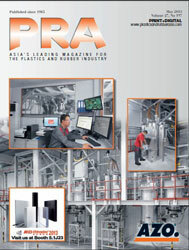 A 2900 model with a 32+32-cavity cube mould from Foboha was shown producing two-colour flip-top closures for Pril washing-up liquid bottles from Henkel. Meanwhile, Michael Hehl Managing Partner/Spokesperson for Arburg, said the Lossburg-based firm had achieved its record turnover in 2015. He also said that having opened a new assembly hall recently, Arburg’s next major project is the construction of a multi-storey building with a usable floor space of 13,700 sq m to expand its capacity in Lossburg for administration and customer activities, such as training courses and seminars. “This involves an investment of tens of millions of euros. Work will begin in the spring of 2017, after the Technology Days,” he added. The company set up a new subsidiary in Taiwan this year, bringing the total number of Arburg national organisations to 25 at 33 different locations.